Alice in Wonderland is a beloved literary and film character. 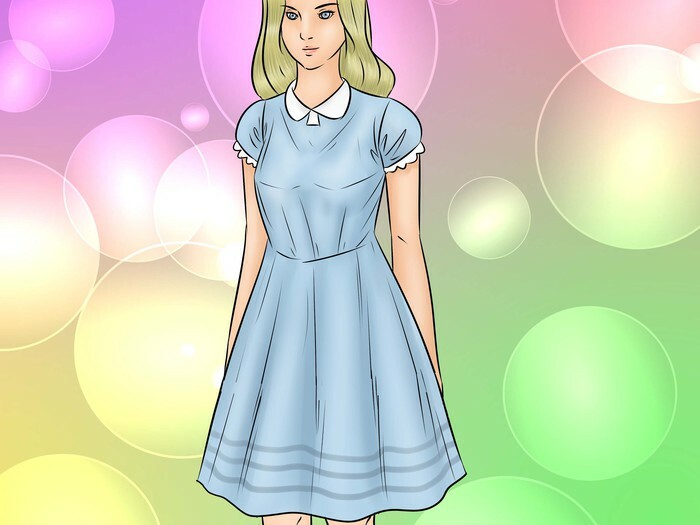 Perhaps you’d like to dress up like Alice for a fancy dress party, a special event, or Halloween. There are several different depictions of Alice, of which the most well-known is probably the 1951 animated Disney film. However, the original illustrations by John Tenniel differ in several respects from Disney’s interpretation. Tim Burton’s 2010 film offers a more adult look for Alice. Whichever version you choose, Alice’s look is easy to replicate, and you can add props or accessories to make your costume authentic with an individual flair. Choose a dress. 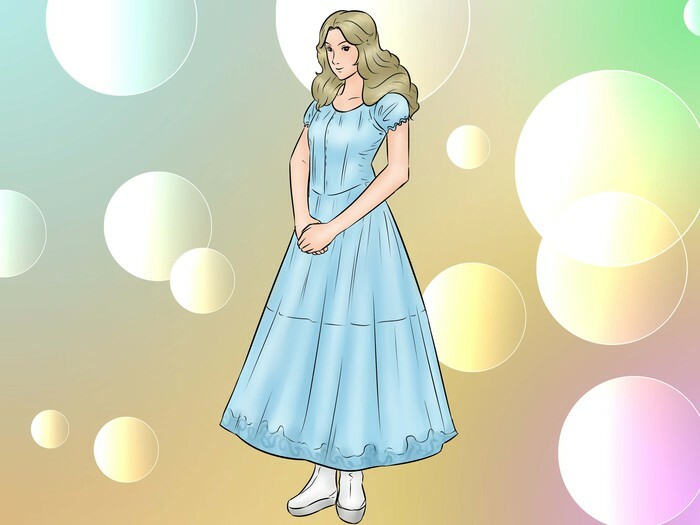 In the Disney version, Alice wears a short-sleeved light blue dress that falls mid-calf. Thrift stores often carry inexpensive dresses that can be accessorized to look like Alice’s dress. 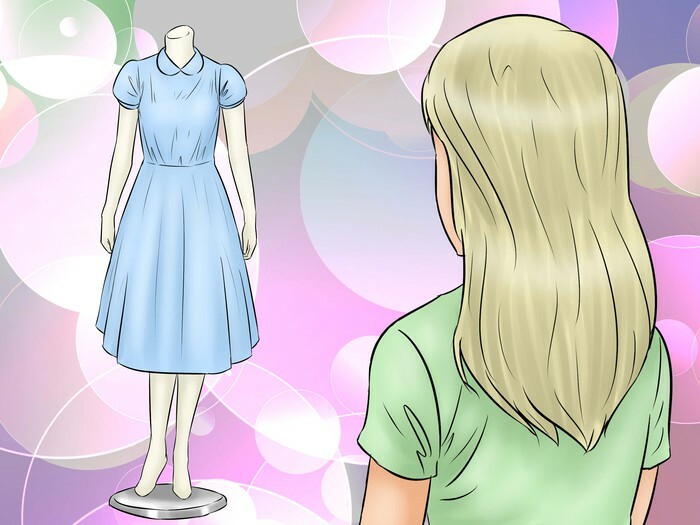 Look through dress patterns at a fabric store to find an old-fashioned puffed sleeve dress. Some costume books may also include a pattern for a pinafore. Search online for a premade costume that includes a blue dress. Pick a pinafore. 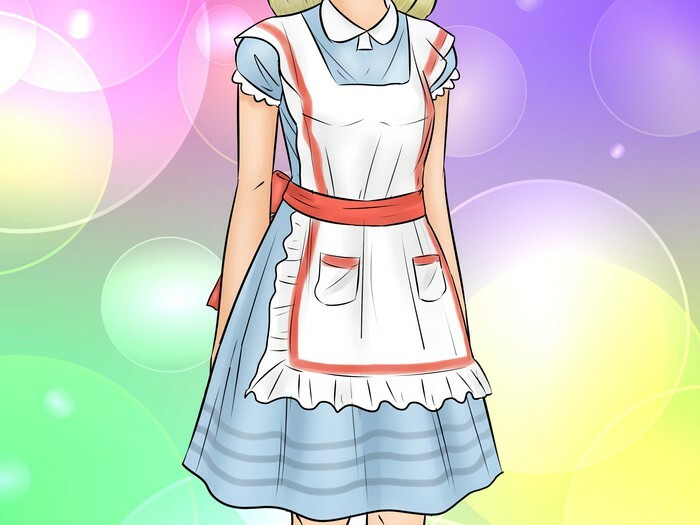 In the Disney film, Alice wears a pinafore, which is a short apron that also covers the front of the bodice. A kitchen apron may be an affordable alternative to buying or making an authentic pinafore. Select stockings. Disney’s Alice wears white tights. Keep in mind the temperature for when you’re wearing your costume. If it will be outdoors in cool weather, choose the warmest tights you can to offset the flimsy dress. Knee-high stockings might be more comfortable in warmer weather. Wear strappy flats. 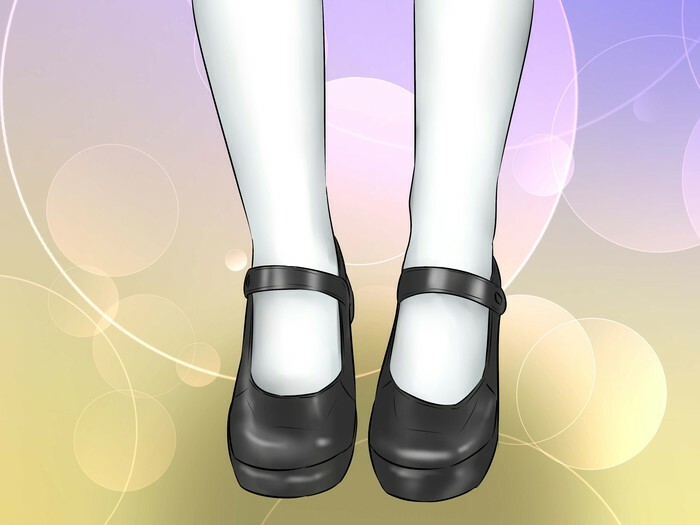 In the Disney film, Alice wears flat black shoes with a horizontal strap, a style of shoe commonly known as Mary Janes. Choose a hairband. The headband is so often associated with this character that it is sometimes called an Alice band. The Disney film features a black headband with a bow. If you do not have a headband, a black ribbon will work well. Pick a dress. For much of the film, Burton’s Alice wears a blue dress that falls close to ankle-length. In some scenes her blue dress is loosely draped and worn off the shoulder. However, in the court scene she wears a strapless red tea-length dress with white and black sheer overlay. Adults may own a suitable red cocktail dress. The loosely draped version of the blue dress would be difficult to buy or construct, but could be appropriate as an informal toga-style costume. Vintage stores and thrift shops can be good places to find affordable longer dresses that can be modified to look like Alice's film costume. Decide whether to use a pinafore. 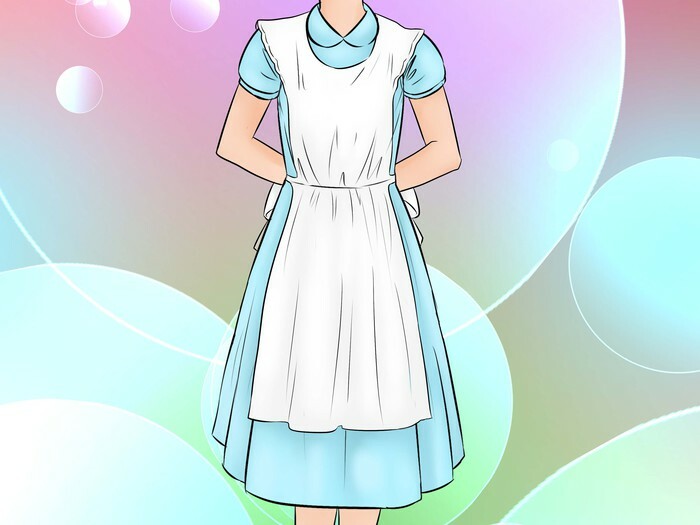 In the film, Alice does not wear the iconic white pinafore. However, the overlay on the red dress is something like an apron worn backwards; open at the front, covering the back. 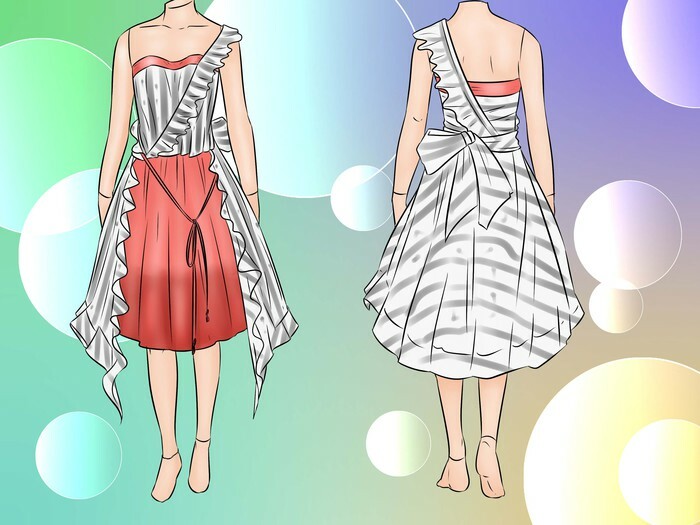 You can make your own reverse pinafore by tying a length of black and white fabric across the back of a red dress, and draping part over one shoulder. Choose your stockings. 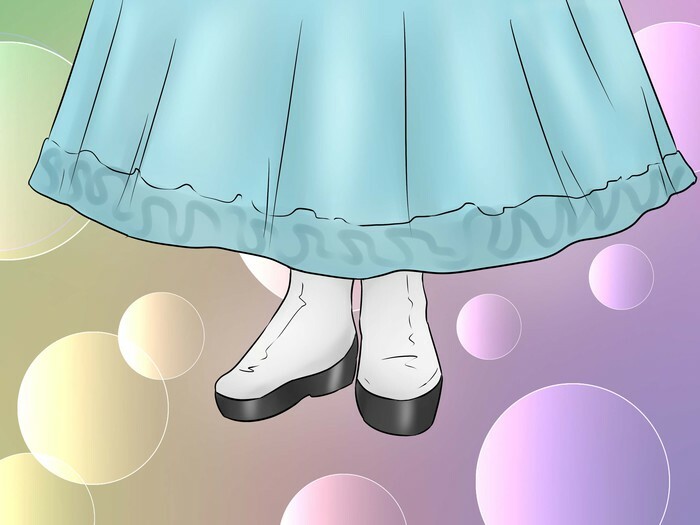 In the film, Alice wears white-tinted stockings but they are sheer and not terribly distinctive. In warm weather, going without stockings would likely be as appropriate as wearing nylons. Find the best footwear. Burton’s Alice wears white lace-up boots with a kitten heel and a black toe. These might be quite difficult to find. Black and white saddle shoes might provide a convincing alternative. Some websites that feature vintage imitation clothing, such as Modcloth, stock high heels in black and white that look similar. Purchasing a pair of white boots from a thrift store and painting them with black accents is an affordable alternative. Style your hair. Alice’s hair is blonde and parted down the center. 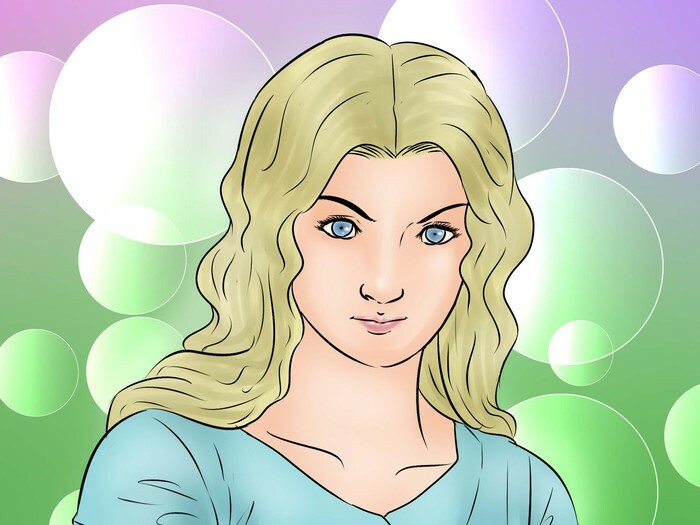 It falls in loose waves around her shoulders without a headband or other styling. If your hair is naturally straight, use a curling iron or hot rollers to achieve more body. If your hair is naturally a color or texture that makes imitating the film look impossible, consider wearing a wig to achieve the full effect. Choose a dress. The original illustrations by Tenniel in the book were black and white with no specific color scheme, though light blue is still the most traditional color in subsequent editions. The first edition with colored illustrations, called The Nursery Alice, featured Alice wearing a yellow dress. While this is an authentic and viable alternative to a blue dress it might not be instantly recognizable to others. In some early editions of Through the Looking Glass, the sequel to the first book, Alice is wearing a red frock. Like a yellow dress, this may not instantly signal to others that you are dressed as Alice. Add an apron. 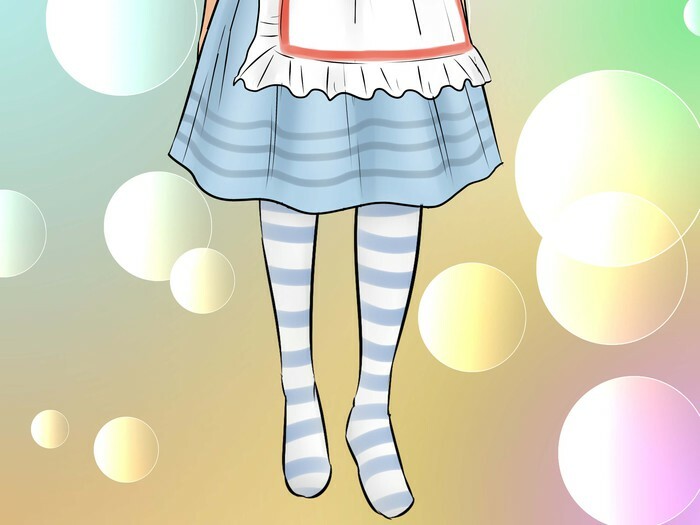 In the book, Alice wears a small apron, also called a pinafore. The illustrations by Tenniel show a white pinafore some trimming around the edge, which in some editions is colored blue. Consider adding some ribbon to your apron if you want to look more like the books. Decide on tights. 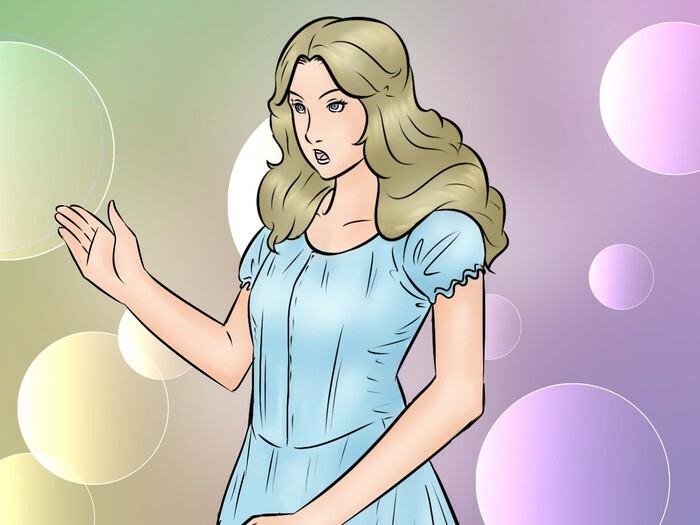 The book illustrations offer more freedom in depicting Alice because they originally had no color, so you could select any shade you think goes well with your dress. One early edition added blue stockings to go with a yellow dress. 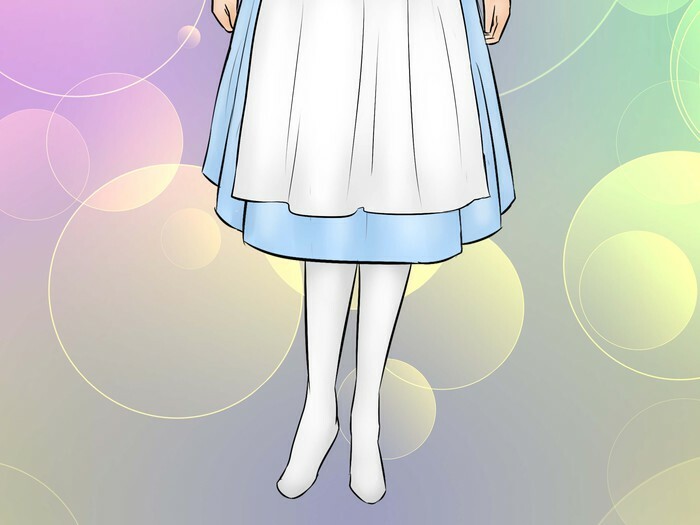 In Through the Looking Glass, Alice wears stockings that have horizontal stripes, sometimes colored in blue and white. For an individual flare, wear striped stockings instead. Decide whether to wear a headband. In the original book illustrations, Alice did not have a headband. Tenniel added that detail in the sequel Through the Looking Glass. Decide which book you would like to imitate, and add a headband if you like the look. 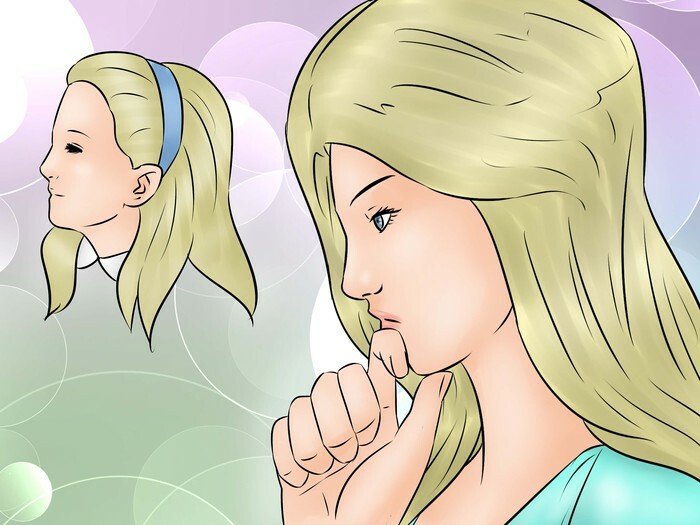 If you go without a headband, tuck your hair behind your ears and wear it loose around your shoulders, if it is long enough. Choose a prop. Think about what part of the story you like best and consider if there is an object you could carry that would signal to others your character. 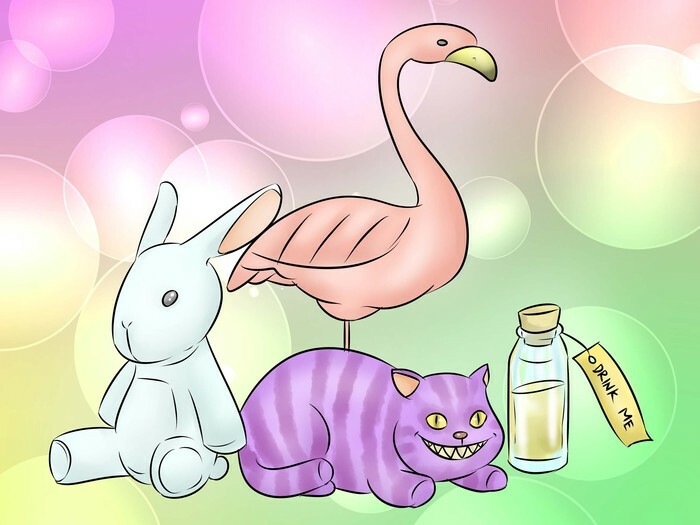 One good option would be to carry a stuffed animal such as a white rabbit or a striped cat. A plastic flamingo could work well for enacting the croquet scene. An old fashioned bottle with the label “drink me” might fit well in a pinafore pocket. Practice acting like Alice. Reread the book, or watch your favorite film version and pay attention to what lines you particularly like. Write down ideas of phrases that you could plausibly work into conversation. If you are at a party, pretend to grow or shrink as you eat food or have a drink. Alice is well known for saying “curiouser and curiouser!” in reaction to the many strange things she sees. The Disney film features several songs that you could sing or hum if the occasion arises. Invite others to join you for a group costume. 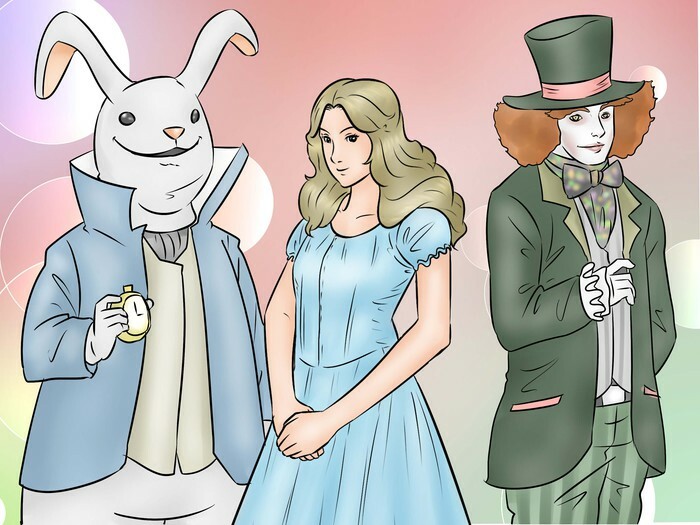 If your friends are also dressed as characters from Alice in Wonderland it will be easy for everyone to recognize your chosen character. The Mad Hatter is a very popular option from the Burton film. The White Rabbit would be a warm costume for a winter activity.